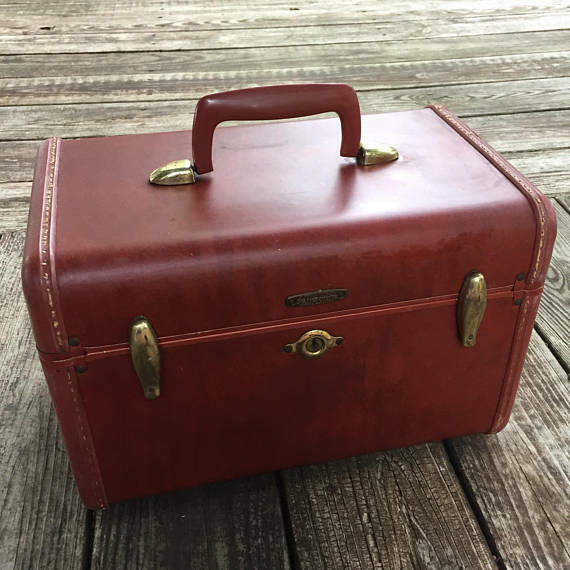 I enjoy traveling around in search of vintage treasures, so others can enjoy them at home. You can find these treasures at Capt. Scrap Antiques, Collectibles, and More, a vintage co-op at 602 Washington Avenue in Woodbine, NJ, or online in my Etsy shop, The Vintage Vagabond 1967. 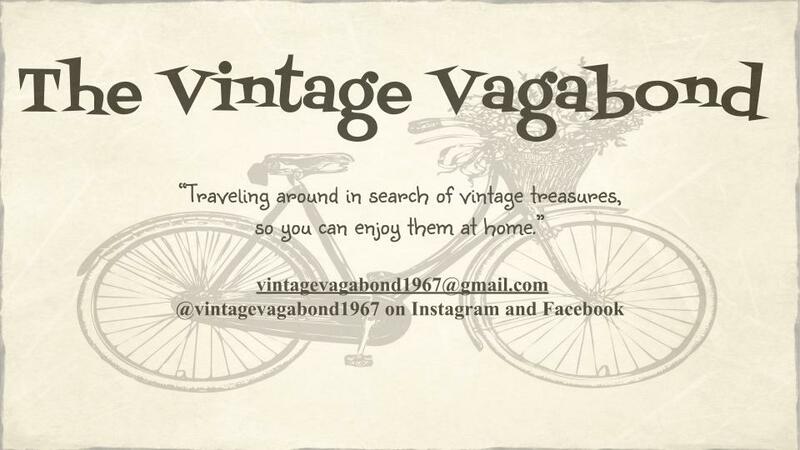 On May 12th, The Vintage Vagabond set up our first vintage pop-up shop with Wanda, our 1981 Sunline travel trailer, at Whitesbog Village in Browns Mills, New Jersey at their first annual Vintage Market, Car, and Tractor Show. After months of sourcing inventory, weeks of pricing and tagging items, and days of packing everything safely for transport, I was excited that the big day had finally arrived. Not even waking up to some pretty steady rainfall could dampen my spirits. I was ready to conquer my first vintage market even if it meant dodging puddles and raindrops to get the job done. Fortunately for everybody involved, the rain stopped right on cue and the ground dried up quickly. Our set up went very smoothly, and I am proud to say we were ready for our 10:00 start by 9:45 AM. In addition to getting my first vintage market under my belt, I got to visit an amazing venue. If you're from the Delware Valley, and you've never been to Whitesbog Village, you should put it on your "Places to Visit" list. According to their literature, the Whitesbog Preservation Trust invites visitors to travel back in time to learn about the history of cranberry farming, life in a rural South Jersey company town and the individuals and culture that supported the farming operations and Elizabeth White’s efforts to cultivate the first highbush blueberry. Vintage Day at Whitesbog included visitors in period costume, vintage tractors and cars, museum tours, gallery walks and not just one, but two jug bands. And that wasn't even the best part of the day. More than anything, I enjoyed meeting some great new people. I got to talk to a young lady who purchased an English pitcher for her grandmother for Mother's Day and some binoculars for her grandfather. While we chatted, she explained to me how she lived on a nearby 47 acre blueberry farm with her grandparents. Then, there was one of the world's greatest grandmothers who bought a package of vintage marbles from me on the sly so she could spread them around for her grandson later in the day so he could "find some treasure". She also bought him a vintage telephone because he was having so much fun playing with it in my display. I couldn't help but think how lucky the little guy was. And that's not to mention all the awesome volunteers who work at the village, or my new friends, Jaclyn and Michael, from Merchantville Antiques and Salvage. If this market is any indication of what I can expect at future markets and fairs, sign me up now. 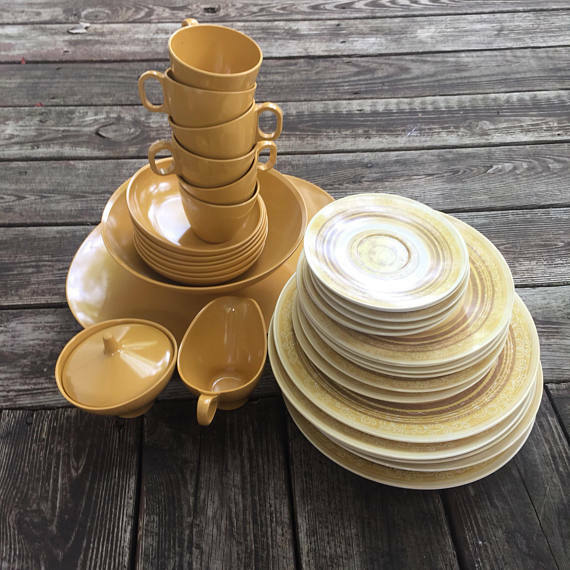 Being outdoors, visiting new places, meeting new people, and connecting customers with quality vintage wares are some of my favorite ways to pass the time. I can't wait to see where my next vintage market application takes me. Painters love a blank canvas. Sculptors can't wait to get their hands on a fresh lump of clay. Designers see beautiful gowns where the rest of us see scraps of fabric. Each artist or creator has a medium that ignites their passion and calls to their expressive spirit. And I am no exception. All I need to get my creative juices flowing, is a few blank walls and some empty shelves. I've always been drawn to visual arts like photography and scrapbooking, but in recent years, I've come to learn that I also love visual merchandising. I get deep satisfaction out of arranging (and rearranging) items to maximize space and create maximum visual impact for shoppers. That's why I was so excited when I was offered a new, larger space at Capt. Scrap's, the vintage co-op where I have some of my inventory displayed in Woodbine, NJ. The new space is three times the size of the spot I was previously occupying at the co-op, and I was inexplicably drawn to it the minute that it was suggested I could move there. At first, I had been offered the chance to move to another spot on the property, but I just wasn't feeling that space so I was dragging my feet about committing to the upgrade. Then, the idea of moving to the Red Shed was presented to me, and I was hooked. You have to start somewhere. This seemed like a good place to me. The move took a lot longer than I anticipated and stretched me to my physical, mental, and emotional limits, but I was determined to get it accomplished sooner, rather than later. Wall treatments were hung, floors were painted, furniture was repurposed, windows were washed, inventory was relocated, and new displays were created - all done on the weekends or in the evenings after regular work hours. Thank God for caffeine and adrenaline. I also could not have done it without my husband's patience, support, and muscle. We actually make a pretty good team. I specialize in "vision", and he's the master of "execution". Lucky for me, he knows his way around a tool bag, and he's pretty handy with a paintbrush, too. I have let out a huge sigh of relief now that the lion's share of the work is done, but I am not naive. I know there will always be more work to be done. And that's not a bad thing. If the retail gods smile down upon me, I'll be rotating new inventory into my space on a regular basis to replace all the goods and wares that are flying off the shelves and the walls. Getting to design new displays on an on-going basis is one of the best parts of visual merchandising. If you are constantly seeking to satisfy the creative impulses emanating from the right side of your brain the same way that I am, then you'll understand how grateful I am for this opportunity and how much I really need it. So, if you happen to be in the area, please stop by and see our handiwork for yourself. I predict that train case will not be around very long. Never underestimate the impact your walls can have. On May 12th, I was a vintage vendor for the first annual Vintage Day at Whitesbog Village at the Whitesbog Preservation Trust in Pemberton, NJ. Instead of leaving from Philadelphia at the crack of dawn to get to the destination in time to set up, I decided to head to the area a couple days early and do a little camping. My husband and I stayed in a cabin on Pakim Pond in Brendan T. Byrne State Forest. For $65 a night we had electricity, two sets of bunk beds, a fireplace, a dining table with benches, two chairs, a full kitchen, a half bath , and a dock on the pond. We were a two minute drive from the bath house where the amenities were clean, the shower pressure was great, and the water temperature got nice and hot. These first few photos are pictures I took for myself. They're the ones I want to save to remember the trip. There's something to be said for a good Adirondack chair. There WILL be a fire in here tonight. Bring your own candle. The cabin smells like A CABIN! These next few photos are for you, anyone who found this blog because you are interested in camping in the cabins at Brendan T. Byrne State Forest. The photos are unedited and a reliable representation of what it looks like inside Cabin 1. I've slept in less comfortable beds than these. I just kept looking around and thinking how easy it would be to glamp this place up. My workspace for the weekend. In addition to the three cabins on Lake Pakim, there are eighty two tent and trailer sites in Brendan T. Byrne State Forest, all located a convenient distance from restrooms, showers, and laundry facilities. Additionally, there are three yurts available, each featuring a lockable wooden door, and a pair of bunk beds to sleep four. Once you're out the door of your cabin (or the flap of your tent), you won't be disappointed. You'll be staying in 34,000 of protected forest lands in the Pine Barrens of New Jersey. The camp sites are situated in a diverse forest of pine, oak, maple, sweet gum, and Atlantic white cedar trees. It really is a beautiful rustic locale. I mentioned that we were at Brendan T. Byrne State Forest , because I had the Vintage Market at Whitesbog Preservation Trust, but you don't need to have an excuse to visit. The park's trails (25 miles of them) offer hiking, nature trails, horseback riding, biking, mountain biking and the well-known Batona Trail. You can also hunt and fish in designated parts of the forest. We also saw visitors riding dirt bikes which I understand must meet very specific state regulations. On our trip, there was a group of horse owners staying at one of the group camping sites for a competitive nature trail competition. We also saw signs for organized activities at a Nature Center. It's the perfect destination for anyone who loves the outdoors and appreciates natural beauty. You can make your own reservation HERE. This Saturday, one of the stops on our yard sale route was an estate sale. The sale was scheduled for 10:00 AM so we hit a few other stops before heading there. As we were pulling up to the house, I told my husband I hoped the line at the estate sale would not be too long. I quickly learned that the yard sale odds were not in my favor on this one. There were so many people waiting to get into this sale, that it looked like the line outside of a concert venue. 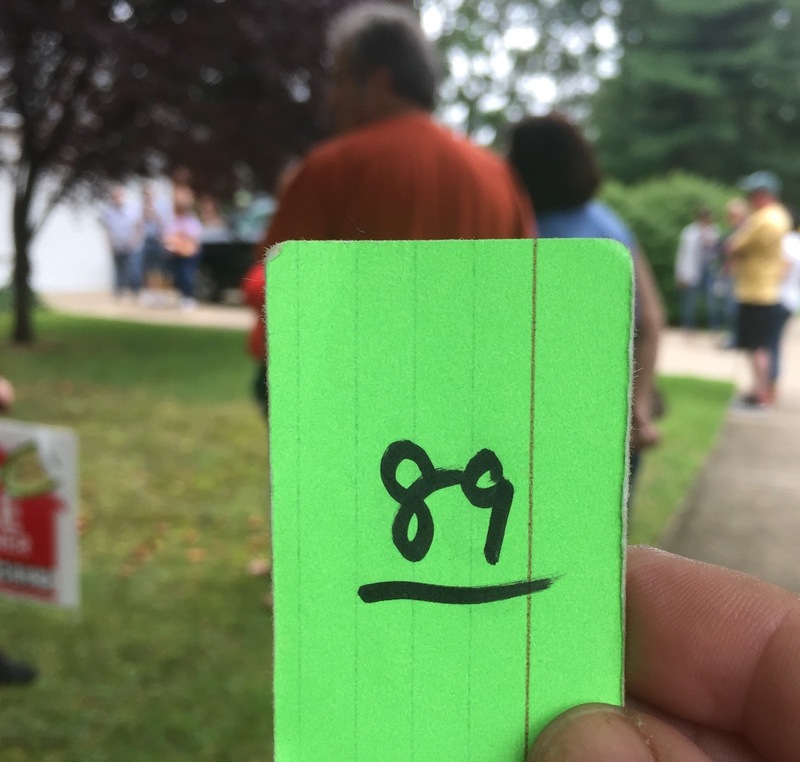 I was more than a little disappointed when the guy guarding the front door handed me the number "89", and no one had even entered the house yet. As you can imagine, as the 89th person being permitted to enter the home, I had plenty of time to kill while I waited for my turn. What I did to pass the time was strike up conversations with all the other junkers on the lawn. I talked to a bunch of people about a lot of different topics, and during my conversations I discovered something that surprised me. I thought everybody knew the secret to finding all the best yard sales using their smart phone, but I was wrong. Not one of the devoted yard sale shoppers I talked to on Saturday knew about the Yard Sale Treasure Map app, and that got me thinking that there might be a lot more people out there who were still yard saling in the dark ages. If that's the case for you, prepare to have your mind blown. When I started going to yard sales on Saturday mornings fifteen years ago, the system I used to find nearby sales was complex and labor-intensive. I searched for sales on Craig's List and selected the ones I thought were worthwhile. Then, I planned a route in my head and used Google Maps to construct the route. 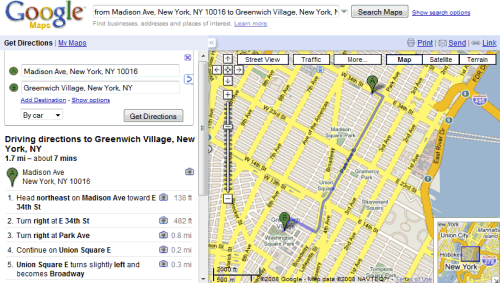 First, I entered my home address and the address of the first yard sale and printed those directions. Then, that first sale became the departure location in the second set of printed directions and the next yard sale became the destination. This process went on for the better part of Friday evening until I had directions to all the sales I wanted to visit the next morning. It was a true labor of love and clearly illustrated the depth of my devotion to bargain hunting. 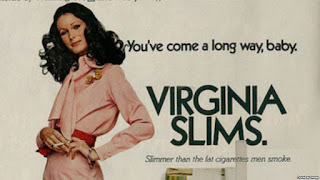 The Virginia Slims slogan, "You've come a long way, baby," is the first thing that comes to mind when I think about how much my yard sale mapping experience has changed since those early days. Getting a GPS navigation system for the van many years back was the first major advance in the process. Typing addresses in the GPS was a thousand times easier than the old printout system, but I was still devoting a good part of Friday night to locating the right yard sales on Craig's List and making a list of addresses for the GPS. Then, I got an iPhone a couple years ago, and my world was rocked by one trusty little app. Shawn Kolodgie may not have any idea who I am, but I am forever indebted to him. Shawn is the creator of the Yard Sale Treasure Map app. This app, available for iPhones and Androids, is designed to help users access local Craig's List garage sales on their mobile device. Users can view local sales in map or list format, view sale details and photos, get directions to the yard sales from their current location, and take advantage of in-app organizational and route planning features. In my opinion, this app is a game changer for yard sale enthusiasts. For me, personally, it revolutionized the way I "do" yard sales on Saturday mornings. That little blue dot in the photo above represents your current location, and the green pin is your home location. The blue dot travels with you as you move along your route, and the green pin is stationary. You can change the location of the green pin by entering a different zip code into the app when you are looking for yard sales. This is a useful feature if you are home in Philadelphia on a Wednesday, and you want to see what the sale prospects look like at the Jersey shore on Saturday. You just enter the zip code at the shore and violá, you can see the sales that are listed there for Saturday. Each of the red pins is a yard sale listed on Craig's List. When you click a red pin the address of the sale pops up in a tab. When you click the tab, the app takes you to a description of the sale including start time, items for sale, and photos if the yard sale host has posted them. If you like the contents being offered at a certain sale, you can click the arrow in the blue diamond on the bottom of the screen, and you will be taken to the maps system on your phone. On an iPhone you are taken to Apple maps and Siri takes over at this point giving you turn by turn directions to the yard sale you've selected. This system allows you to plan the most efficient and time saving sale route possible. Yard sale diehards know how important it is to maximize your time when you are trying to squeeze the greatest number of sales in, in a four hour or five window. The Yard Sale Treasure Map app has only been reviewed 23 times. 20 of those reviews are 5 stars, and that number will be 21 when I get around to adding mine. However, the one user who gave the app a 1 star rating does bring up a good point. In order to access all the necessary features of the Yard Sale Treasure Map app, you do have to pay a $1.99 subscriber's fee. Some people have strong objections to paying for apps on their phone, and if you are one of those people it's not really worth downloading the app at all. What you get for free is not all that useful. It's really that $1.99 fee that unlocks the magic. I'm not going to tell you how to spend your money, but I will say this was the best $1.99 I've ever spent in my life. It helps me find great items like these with ease, and that makes me very happy. I'd love to hear from you in the comments below. 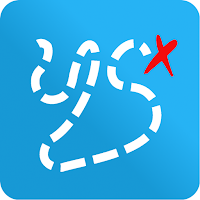 Do you already use the Yard Sale Mapper app? If so, what do you think about it? Are you going to download the app now that you've read this post? If so, please stop back and let me know what you think about it. My name is Stacy, and I'm a sixth grade teacher by trade, and a vintage resale enthusiast by choice. 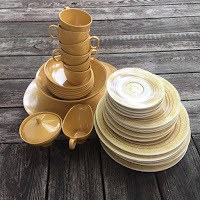 When I'm not busy teaching lessons and grading assignments, I am on the hunt for vintage treasures at local thrift shops, estate sales, and yard sales. Here's the story of how my obsession with all things vintage came to be. Yard sale shoppers know this image all too well. Good thing my van is a Stow 'N Go model. Fifteen years ago, I went to my first yard sale with my sister-in-law. She was a seasoned veteran with an impeccable knack for finding incredible bargains, and I wanted in on the game. Saturday mornings became my escape. I left my husband and four kids at home and hit the yard sale circuit in earnest. I shopped for my home, my family, my classroom, and my friends. 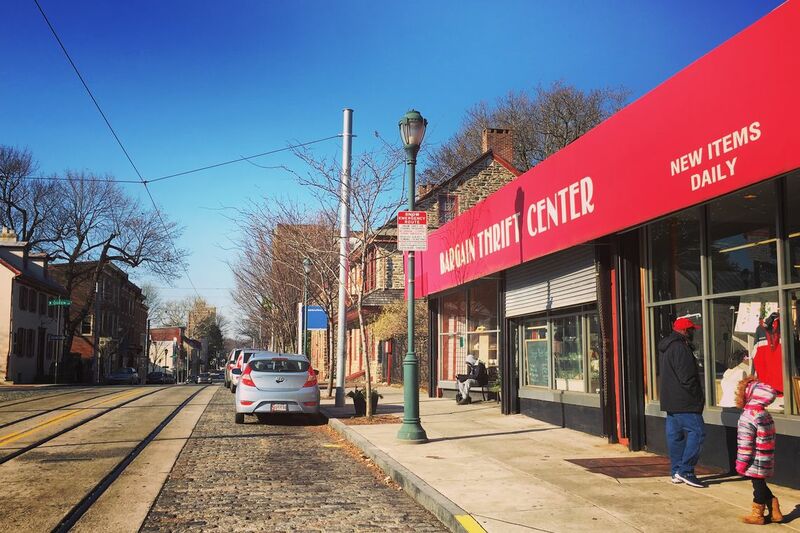 visit Bargain Thrift Center in Germantown. You won't be disappointed. I was content in my role as yard sale hobbyist for many years, and then something amazing happened. I ended up working at Bargain Thrift Center, my cousin's thrift store, on Saturdays. 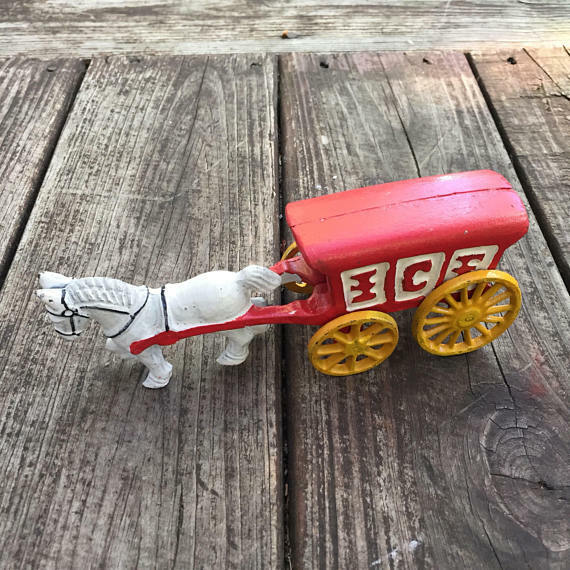 One thing lead to another, and before I knew it, I was a listing manager for Vintage Character, her Etsy shop, and we were making the rounds on the local vintage market circuit together. I had found my "thing". Taking a break from "Antiques Camp" in Michigan and visiting a 4-H Fair. Fortunately for me, Sue is an accomplished business woman and a virtual fountain of vintage knowledge. I spent several years under her expert tutelage, learning the tricks of the trade. Sue even took me to "Antiques Camp" in Michigan once to help me learn how to determine the value of vintage items. Taken on move-in day at Capt. Scrap Antiques, Collectibles and More in Woodbine, NJ. Then, in February of 2017, I got the opportunity to join a vintage resale co-op called Capt. Scrap Antiques, Collectibles, and More near the lake where we vacation. I decided it was time to venture out on my own and give small business ownership a shot, and I am so happy I did. Capt. Scrap's is amazing: six buildings full of the best vintage and antique vendors you'd ever want to meet. I am happy to report the co-op endeavor is working out very well. I love tending my small space and sales are solid. Luckily for me, my biggest challenge is space. I find so many awesome treasures that I don't have enough room to display my entire inventory. 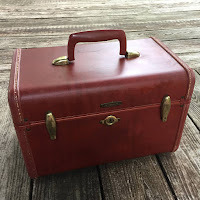 Eventually, I realized opening my own Etsy shop would allow me to be able to bring even more of my vintage riches to a much wider audience, and VintageVagabond1967 on Etsy was born in June. 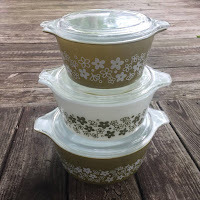 Pyrex Casserole Dishes available in my Etsy shop. Its been a most enjoyable journey going from a yard sale hobbyist checking items off the wish lists of my family and friends to an independent small business owner offering my vintage wares to a global customer base, and I look forward to building an extensive and amazing shop inventory for both my local and world-wide customers' shopping pleasure. If you are in the South Jersey area, check out Capt. Scrap's in Woodbine.